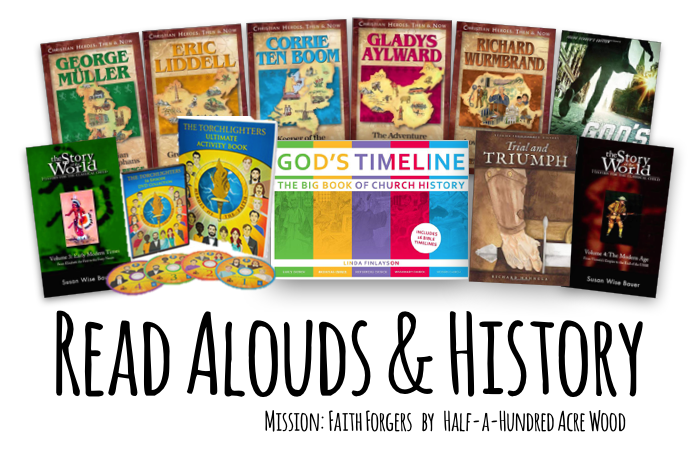 Join us as we recount the wondrous works God has done from the time of the early church to today! This full 36-week curriculum guide provides an integrated study of Europe and Asia, including church history, missionary study, hymn study, fine arts, science, geography, and history. Our price of $379 is a savings of over 20% off the retail price (over $100 in savings) and free media mail shipping is included! 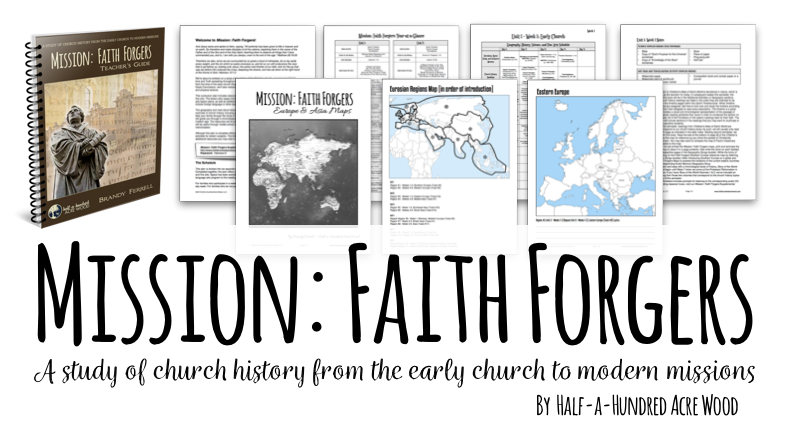 Mission: Faith Forgers Teacher’s Guide. Spiral Bound. 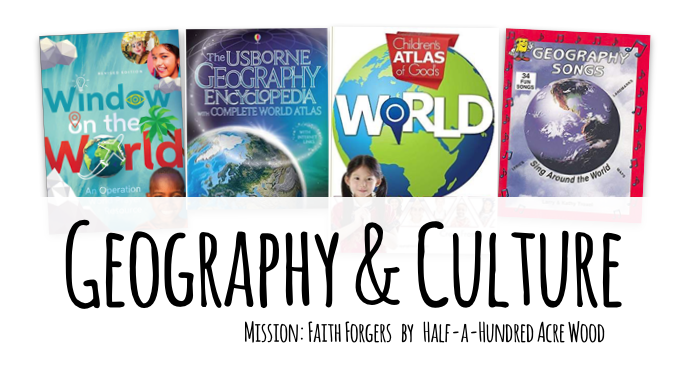 Access to Mission: Faith Forgers Supplemental Resource Webpage. Digital Access. KJV Songs (Bible Readeez) CD/DVD combo. George Muller: The Guardian of Bristol’s Orphans. Softcover. Eric Liddell: Something Greater Than Gold. Softcover. Corrie Ten Boom: Keeper of the Angel’s Den. Softcover. Gladys Aylward: The Adventure of a Lifetime. Softcover. Richard Wurmbrand: Love Your Enemies. Softcover. God’s Smuggler (Young Reader’s Edition) by Brother Andrew. Softcover. Our Universe Student Text. Softcover. 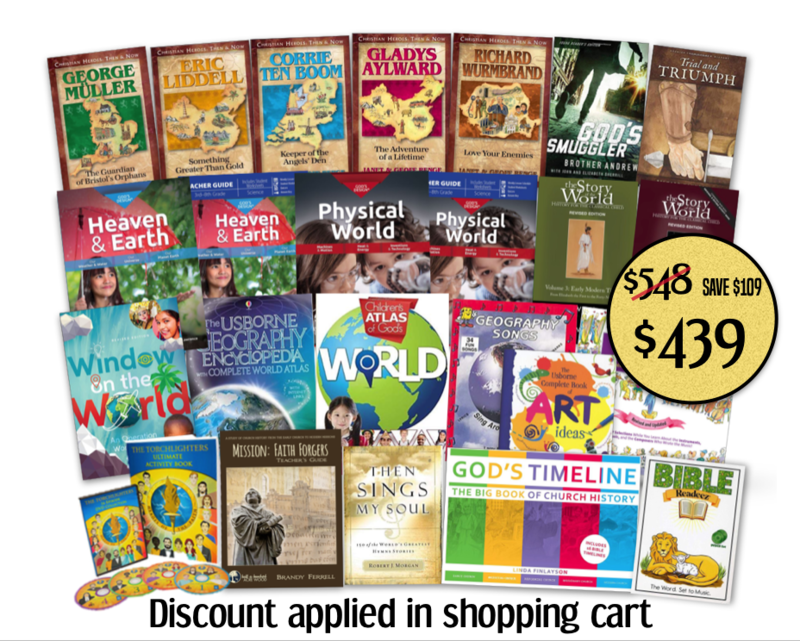 Our Universe Teacher Supplement. Softcover. ﻿Machines & Motion Student Text. Softcover. Machines & Motion Teacher Supplement. Softcover. Story of the World Volume 3. Softcover. Story of the World Volume 4. Softcover. Torchlighter Ultimate Activity Book. Softcover. Usborne Complete Book of Art Ideas. Spiral Hardcover. Then Sings My Soul. Softcover. Window on the World. Softcover. Usborne Geography Encyclopedia with World Atlas. Hardcover. Child’s Atlas of God’s World. Hardcover. Geography Songs. Booklet and CD kit. Story of the Orchestra. Hardcover.